Live Streaming the New Vlog? Mobile devices go everywhere with you and can capture everything you see. Two apps connect to Twitter so you can create your show on the go, live! Why? To share something you are experiencing in the moment, to carry on live conversations for learning, issues exploration or marketing and just sharing because you want to. Meerkat was first on Twitter. Open the app and it immediately begins recording what your phone or iPad camera is seeing, That, in turn is streaming live to your Twitter feed. You can schedule it to air later if you wish and it will you how many are watching, and even who. When you stop broadcasting, itʻs gone, evaporated. You can save it to your photostream as the broadcaster, but viewers cannot. Although Meerkat was cut off from Twitterʻs social graph, making it difficult to find other Meerkat users, its developer Rubin got to work. Itʻs now available by businesses on Facebook, has "mobs" of concurrently broadcasting groups, and has created an API for developers to incorporate Meerkat into other apps. Itʻs now available on iOS and Android. Hereʻs a quick preview. And hereʻs my 30 second experience. 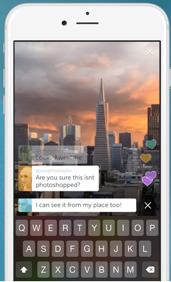 Some feel Periscope is better developed and functionally more appealing. Unlike Meerkat youʻre asked when youʻre ready to start broadcasting and can choose who will see your broadcast, and if you want the stream saved for them to see later. Choose any of your Twitter contacts to follow with a simple click, or access global streams. Type a message to the broadcaster or tap your screen to send hearts to say you like their broadcast. The "most liked" posters appear in the Leaderboard list. Android is not yet ready, but coming. Mobile live streaming is in its infancy and with it we could take learners, and learners could take their friends and ‘ohana to places and start interesting real time conversations. The competition is on!